Before wrapping up 2014, Banowetz + Company had the pleasure of working on the annual jewelry catalog for our long-time client Eiseman Jewels. Each year, just prior to the holiday season, we create a showpiece featuring Eiseman’s top designers to be mailed to their clientele and affluent areas throughout DFW. This year’s piece featured the additions of jewelry and timepiece designers new to Eiseman, including such names as Oromalia, Gucci, Roberto Coin, Audemars Piguet and IWC Schaffhausen. Best Press printed the forty-page perfect-bound book. Below are some sample pages for your viewing — and shopping — enjoyment. Banowetz + Company was excited to once again produce a catalog for our client, and luxury jeweler Eiseman Jewels, located at NorthPark Center. 2013 marks Eiseman’s 50th anniversary and the catalog is a great way not only to showcase exquisite samples from their collection, but also to inform readers about the recent addition of a space exclusively dedicated to Rolex timepieces and plans for a salon remodel in early 2014. Printed by Best Press, the forty-page books were mailed to Eiseman’s clientele and to affluent areas throughout DFW in early December. It features stunning pieces by celebrated jewelry designers such as JB Star, Katie Decker and Temple St. Clair and luxury timepiece brands including Rolex and Jaeger-LeCoultre, to name a few. With its clean, elegant design and exceptional content, we think it definitely added some sparkle to the holiday mail. 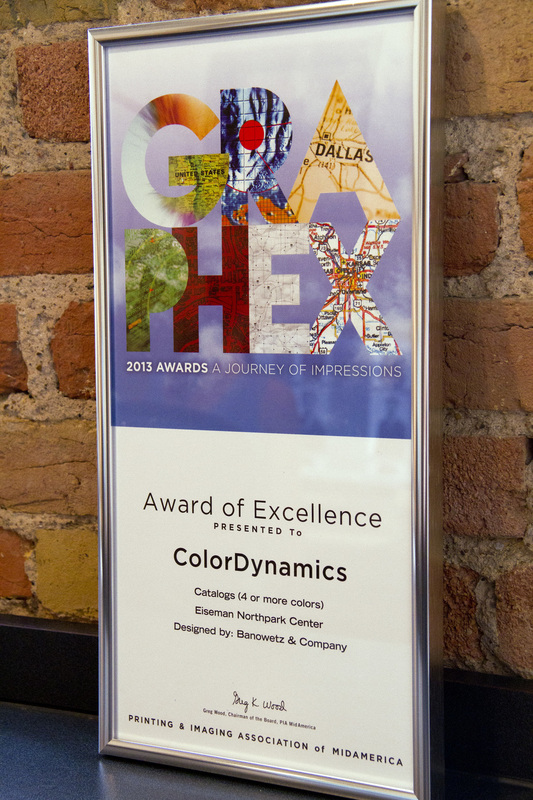 Team Banowetz was honored to be recognized with a 2013 Graphex Award of Excellence, given by the Printing and Imaging Association of Midamerica, for the Eiseman Catalog which printed with Color Dynamics. The luxury jewelry catalog showcased sparkling accessories on a gloss paper with a high-gloss aqueous coating, creating a piece that really shines.